Last summer, my family and I moved from Lafayette, Indiana to Milwaukee, Wisconsin so that my husband could take a new job. Once we got settled in our new house, I politely informed my husband that I would "never, ever move again, so don't even think about asking me." This reaction to moving is a common one. Moving is incredibly stressful, requiring a great deal of planning, money, time, and flexibility as situations inevitably change. 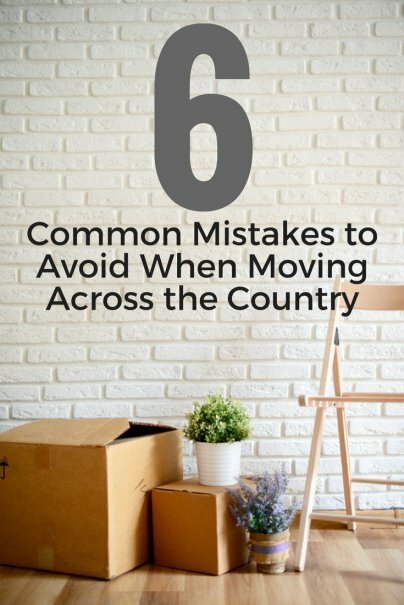 On top of all that, there are a number of easy mistakes to make when planning a move that can add to the stress and the cost of it all — especially if you are moving across the country. Since you're relocating to a different state, it's completely understandable why you might want to hire movers rather than pack up and haul your own stuff in a rental truck. However, it's important to make sure you hire a moving company whom you can trust, since there are a number of scam companies (known in the industry as "rogue operators") out there pulling shady deals. An in-home estimate. Long-distance moving costs are calculated on the distance your stuff has to be hauled and the weight and size of your goods. If a mover offers you a cost estimate sight unseen, it's a red flag that you shouldn't trust them with your stuff. A copy of Your Rights and Responsibilities When You Move. Federal regulations require all registered movers provide their customers with this document. A contract that includes price estimates, pickup and delivery dates, and insurance coverage amounts. To pay at the time of delivery. Reputable companies do not request upfront payment. While it's possible for a moving company to legally make an estimate that is too low, federal law requires registered movers to complete delivery as long as you pay 110 percent of the estimated price. When we left Lafayette in June 2016, our movers cleared out the house on a Thursday, but the Milwaukee temporary housing provided by my husband's company did not kick in until Saturday. We had two nights in an empty house before we could arrive in Milwaukee. This particular moving discomfort could have been avoided if we had planned the move better. We waited to set up the temporary housing, which meant we had fewer choices of which nights we could stay. Our two days of no beds was a relatively minor discomfort. But waiting until the last minute to find a mover or make other major moving plans can cause potentially huge problems. If you have to scramble to find a mover during prime moving season — between May and September — then you are less likely to have the necessary time to do your due diligence to find a reputable mover. You may also find that all of the local rental trucks are already spoken for if you don't call ahead. Moving day is generally a long and exhausting slog. It's even worse if you finally get into your new home, only to find the lights won't turn on because you forgot to get the utilities set up in your name. This kind of mistake is even tougher to deal with if you move on a weekend and you have to wait until business hours on Monday to make the call to your new utility companies. Either your real estate agent or your landlord should be able to provide you with the contact information for each utility you will need in your new home. About two weeks before your move, contact the local utility companies to give them ample time to turn everything on and/or transfer everything into your name. It can hardly be a coincidence that no one has ever coined the expression "as fun and exciting as packing!" Packing is the opposite of a good time, and many a mover has put off doing the important work of sorting and packing their stuff until moving day. Even though my family has been in our new home for over a year, there are still piles of unopened boxes in our basement, each labeled with some variation of the world "miscellaneous." Don't get me wrong, there is a bit of a Christmas morning feel to opening these mystery boxes. I was delighted to find some of our kitchen utensils (along with a couple of framed pictures, a purse or two, and some shoes) in one recently-opened box. But my life would be a lot easier if I knew what was in each box before having to open it. I had forgotten just how long the unpacking process can take, and I had assumed that I'd be unpacking these boxes within a few weeks of packing them, so I'd remember what had been put into "miscellaneous" boxes, sweet optimist that I was. As you pack, make sure you label each box as specifically as you can. You'll be much happier knowing you can put your hands on important things and knowing which boxes can wait a few weeks (or more than a year) to be officially unpacked. Part of the reason why I hate moving is how much upheaval it causes in my family's life. It's my tendency to try to rush through that upheaval as quickly as possible in order to get life back to normal. When I was a single woman in my 20s, I would unpack from moves in a two-or-three day whirlwind, refusing to rest until each and every box was emptied and broken down, and all of my possessions had a new home. But moving cross-country with a family in tow doesn't offer the same kind of opportunities for such an unpack-a-thon. Instead of trying to get everything done as quickly as humanly possible, it's psychologically better to work steadily but surely, on everything you need to do for pre-move, moving day, and the great unpacking. That will help you maintain the energy you need to keep going through the long process of relocating.